John McClure picked up his first fly rod at the age of 12, and has had a difficult time putting it down ever since. He began working at The Slide Inn during the Summer of 2003 while attending The University of Vermont, and started his guiding career in 2005. You can find him working in the fly shop on his days off, where he has been a familiar face behind the counter for ten years now, or out wetting a line in the Madison after work. John has become a favorite for some of our customers due to his ease in working with anglers of all abilities and skill levels, and his general knowledge of area waters. Those that know him well believe he should seek professional help for his on-going streamer addiction, but the truth is that he lives for passing on that enthusiasm and getting his clients into some of the larger browns and rainbows that inhabit the local rivers. John lives at The Slide Inn during the Winter months, and manages the fly shop when he is off the water. Starr was born and raised in southwest Louisiana where he spent his childhood duck hunting and fishing the inland waters of the Gulf Coast. He learned how to fly fish for Redfish, Speckled Trout and Bass, but soon set his sights on big brown trout and headed for Montana. After graduating from LSU with a degree in Marine Biology in 2000, he relocated to South West Montana where he has been at home ever since, with the exception of some time well spent in Hawaii. After all of this time he still finds Montana’s beauty spellbinding and still never tires of fishing and hunting it’s terrain. Starr’s quiet sense of humor and good demeanor have made him a very welcome addition to our staff. Jeremy Clark began his love affair with the Madison Valley in 1997 where he spent his Summers on the Upper Madison with his family. Jeremy hails from Colorado where he went to school and spent the majority of his downtime skiing and fishing the areas around Evergreen. Voted most likely to become a ski bum in high school, he succeeded and moved to Summit County after graduating in 2011. A few years and a couple hard crashes later, he decided to put his skiing career aside and focus more on being a full-time trout bum. He has since become a full time Montana resident, and has been a familiar face in the fly shop for the last four seasons. Jeremy has an extremely easy going personality that meshes with people from all walks of life and skill levels, and is a welcome addition to the guide staff here at the Slide Inn. Parker Smith grew up in upstate South Carolina chasing anything that would put a bend in a fishing rod. From bass tournaments to inshore and offshore saltwater fishing – nothing ever scratched the itch quite like fly fishing for trout. After rambling around the mountains of Western North Carolina for a number of years he decided he needed a change and headed west for Colorado. He guided for a number of years on the Colorado, Fraser, and Blue River before he realized that Montana really is the last best place. No surprise here, but Parker fits right in with the streamer hucking crowd at the Slide Inn. But make no mistake, a bobber down or a rising trout gets his blood pumping just the same. Parker is a friendly, hardworking person that is a pleasure to spend a day in the boat with. A native of Boyne City, Michigan, Scotty packed up in 2004 and headed to Southwest Montana to find a place where he could ski and fly fish. 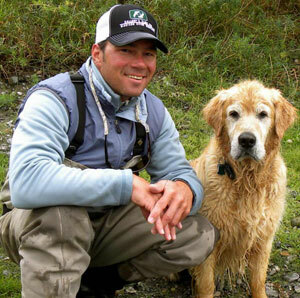 As a guide, he has spent countless days on the Madison, Gallatin, Henry’s Fork, and the waters of Yellowstone National Park sharing his passion for fly fishing with his clients. Scotty works with anglers of varying skill levels and lives for helping beginners land their first trout. On his days off, you will find him pulling big streamers with his friends in a never-ending quest to land a fish of a lifetime while taking in the beautiful Montana landscape. In the off-season, Scotty lives in Big Sky, Montana where he works as a ski instructor for the Yellowstone Club and still manages to spend a couple days a week stalking the wintering browns and rainbows of the Madison and Gallatin Rivers. I started guiding in Central PA in the 80s while attending Penn State University. After 4 years as a Naval Flight Officer I chose this way of life! A professional guide should always be a teacher first—You are dropping some serious cash on a guide trip, and I feel it is my responsibility to teach you some new skills, and make sure you have fun! Sinking lines and 4” hunks of bunny fur turn me on… Or we could throw dry flies all day. You will see me throwing dries all summer long on the Madison and Big Hole……unless it’s cold and cloudy! Trey Braasch is a long-time friend and fishing companion of everyone here at Galloup’s Slide Inn. He has been involved in one facet or other at the Slide since 2005. Born and raised in Pennsylvania’s trout country, Trey Braasch began fishing Penn’s Creek at age twelve. After college Trey headed West and started his guiding career on the Gunnison and it’s many tributaries. On a fishing trip to Montana he decided not to leave and has spent the last 16 years in Montana fishing and guiding its blue ribbon trout streams along with waters in Idaho and Yellowstone National Park. Trey as fishy as they come. While he enjoys fly-fishing of all styles, in his spare time he is most likely to be found stripping junk and hunting steelhead most of the Fall. Trey is also an accomplished fly tier, and has created many of his own patterns for the rivers and lakes around the greater Yellowstone Area. Trey’s methodical nature and great sense of humor make him an incredible guide and companion on the river. Daniel has been an angler and outdoorsman since he was old enough to walk, and began fly fishing at age 9 on the Norfork, White, and Little Red rivers in Arkansas with his Dad. While earning his Bachelor’s degree from The University of Tennessee in Knoxville he continued to learn the art of fly fishing on the Clinch, Holston, Watauga, and South Holston Rivers of the Appalachian Mountains. It only took one trip out to Montana after graduating from school for Daniel to decide that this was the place for him. He packed up his truck and moved to the Madison River in order to pursue the thing that makes him tick, and that is the pursuit of big trout. Daniel loves the challenge of fishing to selective trout, but triggering the aggression of large brown on a streamer is one of his favorite things on the planet. 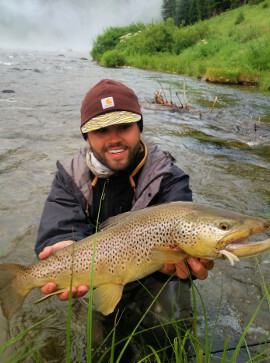 On his days off you can find him looking for that fish of a lifetime in the beautiful waters of Montana or hunting the mountains for the many elusive critters that the Rockies has to offer.